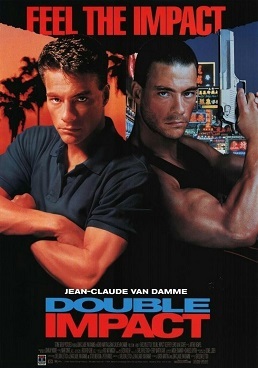 Double Impact is double the damage – double the Van Damme-age to be exact. Before you may have thought “double impact” to be a really ugly type of font, but it’s also a really cheesy movie. This martial arts action flick features mono-zygotic twin Van Dammes, running around Hong Kong. They’re also quite monosyllabic. The film is almost like a bad scientific study about what happens when washed up Belgian has-beens who share 100% of their DNA are raised apart. One teaches aerobics in purple leotards, the other grew up in the mean streets of Hong Kong. They eventually meet and team up to battle gangsters. FEEL THE IMPACT. DOUBLE IMPACT!